Sometimes we can make fun of the "hokey" things churches do to encourage connection with one another. Back in the day, it was popular to draw names among the women and have "secret sisters". For a year you were to pray for that person and, if you felt like doing so, send them encouraging notes or thoughtful little gifts. Ever since I can remember, I struggled with a deep sense of loneliness, a sense of no one understanding or "getting" me. Daddy seemed to be the one who most understood my sensitive spirit and my tendency to give in to flights of fancy. Mama's love language was acts of service. She wasn't one to talk about feelings or emotions, or one to give in to the world of dreams and imagination. When Daddy left Mama and us kids, I felt like I was left with no one in the world who understood me. While outwardly, I was a good student and excelled in school, and a good Christian girl, busy and involved in my church, inwardly I struggled. I would shut myself in my room for long periods of time and escape the inward loneliness, (and what I now know were bouts of depression), through daydreaming until I would fall asleep. I created whole, very unrealistic, scenarios of my future life, including a husband, kids and a home. I escaped frequently to this place where I was never lonely and was always understood. who didn't know, and maybe still doesn't know, that a note from her changed my life. The note, that I still have to this day, said things that no one had ever said to me before...not Daddy, not Mama, not my pastor, no one. She wrote that God had a good plan for my life. She said she felt there was a "call" on my life for ministry. That encouragement, that note that probably took no more than five minutes to write, opened my mind and heart to a life of wide open possibilities. It was, to me, like I had been set free from a cage into a wide open place. It opened the door for me to realize that there was Someone who got me, who understood me, who had made me like I was for a purpose and who had a good plan for my life. This realization led me to go to a Christian college after I graduated from high school. Mama couldn't afford to help me pay for school but God provided for me in a miraculous way that further encouraged me about His good plans for my life. It was at college that I met and married my husband. By God's grace, we have built a beautiful life that is about as far from the perfect life I concocted in my daydreams as east is from west. But the seed planted by that little note that that lonely teenager received, the seed of truth that I was made by God the way I was for a reason and that it was for His good plan and purpose, has sustained me through the times that even my husband didn't get me. I've come to realize, no human being is able to fully understand another. Let's be honest, half of the time I don't even understand myself! But when a young wife and mama sat down to write me a note all those years ago, the Spirit of the One who made me and knows me fully, wrote through her, and it changed my life forever. I'm joining the gang and writing a post for Imperfect Prose. The prompt this week is ENCOURAGE. I love this. 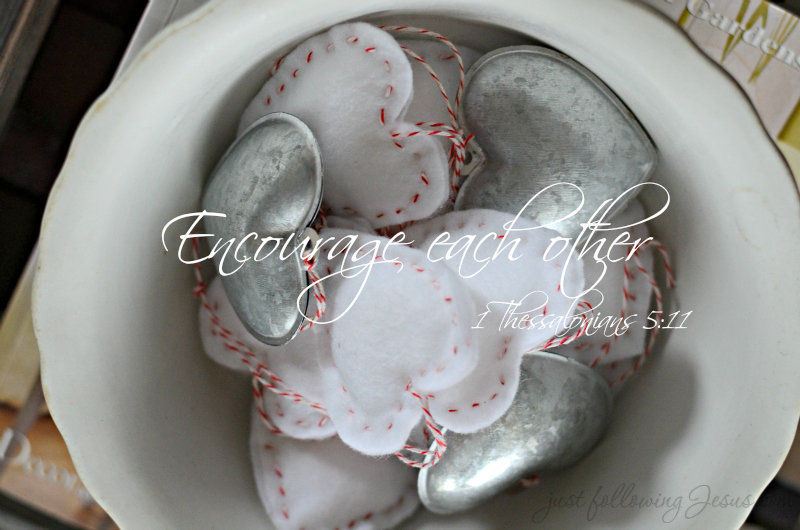 What an encouragement to us to not grow weary in encouraging others. Beautifully written and shared. You know we never know what our words do to someone, just a thoughtful caring gesture, a kind smile, a note in the mail or even now a text to someone. That is why I try to text my thirteen year old grand daughter daily and let her know she is special and loved and I am praying for her. It is just a bit different than mom or dad. Such a beautiful story, God is sooo good! This might be one of the most wonderful things I've read in a while. Elizabeth, so many facets of your story echo my own. I posted here as well, (five little words), and what they meant to me. I had similar feelings as you. Our Father knows just what we need and when. Your words touched me. Blessings to you! What a great story. What a wonderful way to encourage us to maybe do the same thing for someone that she did for you. A dear friend told me many years ago to keep notes and cards in a file - an encouragement file - for days when I felt like locking myself in a room far away from the rest of the world. Days I felt there was no purpose for my life. Days I felt no one understood me or cared. My encouragement file has notes and bits and pieces of God's message to me through people He used to show His plan for me. Notes just like the one you shared with us today. Thank God that there are people who will listen to His voice and share it with us! This is awesome, Elizabeth. Thanks so much for sharing! Thanks so much, Marilyn. You are definitely an encourager to me! Ohmygoodness! This just gave me chills! Scripture tells us to use our words to build one another up, and I am continually amazed to see the way God uses the feeble words of his imperfect children to bestow blessing on one another. I can't begin to count the times someone has come up to me and said, "I remember that time you said _________ . " I always panic just a little, because I rarely remember what I've said. But--and this is the important part--it reminds me to be careful about what I do say and it reminds me that God is pleased to bless others through my words. Thanks so much for sharing this. It is powerful. A beautiful heartfelt story. Thanks for sharing. oh Elizabeth. I have tears for that little girl. I now understand more than ever why the healing prayer ministry has meant so much to you. And I'm so, so grateful for that note of encouragement that changed your life. The written word is so very powerful. Bless you.